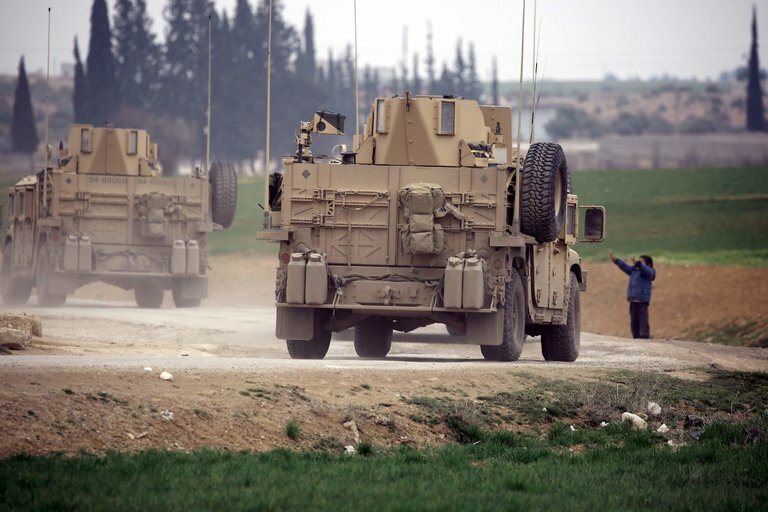 The United States has increased its forces near the northern Syrian town of Manbij as concerns have grown that fighting could erupt among the complex array of militias and Syrian and Turkish troops who are operating on the crowded battlefield near there. Photographs of American troops in Stryker vehicles and armored Humvees flying American flags circulated on Saturday on social media. The American-led command that is fighting the Islamic State, a militant group also known as ISIS or ISIL, acknowledged the buildup around the town, but did not provide details. “The coalition has increased its force presence in and around Manbij to deter any hostile action against the city and its civilians, to enhance local governance and to ensure there is no persistent Y.P.G. presence,” an American military spokesman said, using the acronym for the People’s Protection Units, Kurdish militia groups that have been trained by United States military advisers. The Turks have repeatedly complained that the Y.P.G., which played a critical role in taking Manbij, has yet to vacate the city, despite American assurances that it has done so. American military officials said the total number of United States forces in Syria had not increased. But the new deployment of American troops around Manbij has been done in a visible manner. A combustible mix of forces are crowding the battlefield in northern Syria, including Turkish-backed Syrian militias, Syrian government forces, and Kurdish and Arab fighters trained by the United States. Lt. Gen. Stephen Townsend, who commands the American-led task force that is fighting the Islamic State in Iraq and Syria, told reporters on Wednesday that Syrian government troops had advanced near Manbij to the point where they were within “rifle range” of Syrian Arab fighters backed by American forces. The United States has hundreds of troops in northern Syria who have been training and advising Syrian Arab and Kurdish fighters. The potential for a clash is clear. Abu Amjed, the head of the Manbij Military Council, which has responsibility for securing the city, said during an interview last week that Turkish forces had been shooting at his front lines. Another worry is Ahrar al-Sham, an Islamist opposition group, which has been supported by the Turks. Under a recent agreement that Russia is said to have played a role in brokering, Syrian government forces are moving into villages near Manbij. The Manbij security forces appear to have ceded control of the villages to prevent them from being occupied by Turkish-backed militias or Turkish troops. In a development that reflected the fluid and confusing battlefield, Russian aircraft on Tuesday mistakenly bombed Syrian Arab fighters trained by the United States. General Townsend said the attack, which took place about 10 miles southwest of Manbij, occurred when the Syrian fighters moved into villages that had been occupied by the Islamic State. The Russian Defense Ministry said it had not carried out airstrikes in areas that the United States had previously designated as being occupied by American-backed fighters.